The immediate consequence of the broken collarbone that Mexican striker Javier “Chicharito” Hernandez sustained on Wednesday is bad enough: at this month’s Concacaf Gold Cup, a regional tournament that almost always culminates in a hotly contested USA-Mexico final, Mexico will compete without its most prolific goal scorer. ESPN columnist Andrea Canales called the injury a “cruel setback” for the Mexican team, which hasn’t won any of its last seven games. Sebastian Giovinco’s transfer to Toronto last January showed that MLS is fast becoming a realistic option for big-name players in their mid-20s. Still, the rumors linking Chicharito to Orlando City FC, among other MLS clubs, constitute a harsh verdict on his recent form – and on his distinctive brand of old-fashioned forward play. Chicharito joined Manchester United in 2010, following a series of impressive performances for Mexico at the World Cup in South Africa. His enthusiastic pressing, as well as his signature ability to score goals after coming off the bench, turned him into a cult hero. Fans hailed him as the second coming of Ole Gunnar Solskjaer. The World Red Army, a pop group that records songs about Manchester United, released the single “Chico Is the Man,” an almost unlistenable tribute to the striker’s “gift of God from up above.” Chicharito finished his first season in England with 20 goals in all competitions. Chicharito’s initial popularity probably derived partly from the stark contrast between his energetic playing style and the understated (some would say lazy) approach of Dimitar Berbatov, a brilliant, enigmatic striker who polarized United fans. But since Sir Alex Ferguson’s 2013 retirement, Chicharito has become an increasingly marginal figure at United, a benchwarmer widely mocked for his poor touch and wild passing. He still boasts an impressive goal-to-minute ratio, but van Gaal, who started him only twice before finalizing the Madrid loan deal, seems to be looking for strikers who can create chances and link play. In 2008, Ferguson led the best United team of the last decade to a league and Champions League double. The front three – Wayne Rooney, Carlos Tevez and Cristiano Ronaldo – exchanged positions fluidly, confusing opposition defenders. 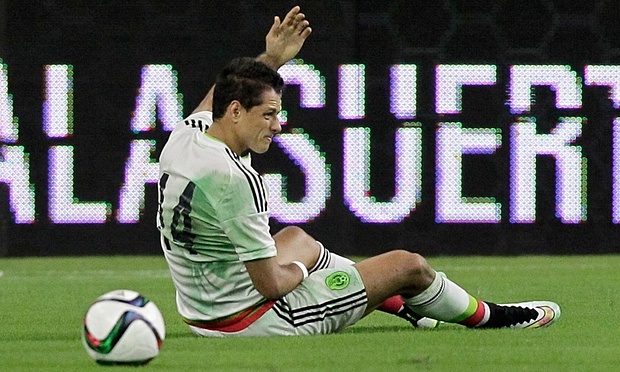 Chicharito wouldn’t operate effectively in such a system. He’s too dependent on the positional stability of old-fashioned formations, the hard-and-fast rules that used to govern where forward players should line up. This anachronistic playing style greatly limits his options. It’s hard to imagine Chicharito starting regularly for any of the ten or so teams expected to seriously contend for the Champions League. Chicharito will spend the next few weeks in recovery mode, hoping to regain fitness before the end of United’s pre-season tour, or at least in time for the team’s Premier League opener against Tottenham in early August. But a broken collarbone is the least of his problems, whether he realizes it or not.